Karbonn is one of the finest native smartphone manufacturers in the market. They are well appreciated for making handsets that offer brilliant features and services at an easily affordable price. Karbonn mobile phones carry great technology and aesthetic designs. Karbonn’s newest smartphone Titanium X has been spotted on its official website, though the price of this device has not been revealed on the website. Let us have a quick look at some of the specifications of the device. Display: The Karbonn Titanium X sports a capacitive Full HD IPS touch display of 5 inches that provides a resolution of 1920 x 1080 pixels. Full HD display is the latest thing with the Indian manufacturers and this is Karbonn’s way of matching up to its compatriot, Micromax and other Chinese OEMs like Gionee. Processor: This handset has been powered by MT6589T MediaTek quad core processor clocked at 1.5 Giga Hertz. This is the same processor that powers the Micromax Canvas Turbo and the Gionee Elife E6 so these are two handsets it will be targeting. Operating System: This device will operate on Android 4.2 Jelly Bean platform and might get an Android 4.3 update as well but we won’t get our hopes too high. Memory: Titanium X is likely to come with a RAM of 1 GB. The internal storage capacity of the device has not been disclosed yet. But who knows, Karbonn might just surprise us and launch it with 2GB RAM and an internal storage capacity of say, either 16GB or 32GB. Camera: This smartphone offers a primary camera of 13 mega pixels with auto focus and dual LED flash features. It also provides a front facing camera of 5 mega pixels that enables you to make video calls. Connectivity Features: The connectivity features incorporated in the Karbonn Titanium X include Wi-Fi, NFC, Bluetooth 4.0, A-GPS and 3G. So NFC is a pretty nice addition to the line up and the device will surely have an upper hand than its rivals in this regard. 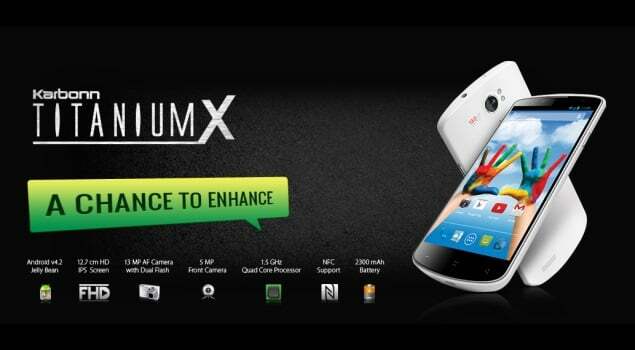 Other Features: It is a dual SIM device with dual standby feature. Battery: This device functions on a battery of 2300 mAh which is expected to last a day. Our Take: The Karbonn Titanium X is quite a decent smartphone with some really useful and functional features. It is likely to offer good competition in the market, especially to Micromax’s Canvas Turbo that comes with almost similar features. The potential buyers of Karbonn Titanium X will have to wait a little for more detailed information to appear regarding the other features of this device and about its launch date and pricing.